I am sure scenes like this one are playing out all over the place as little league season comes to an end and the winners and losers are determined. This particular shot was taken by Jill Stern, a citizen journalist in the finest notion of the term, who is the mother of the Dodger’s star pitcher, and who had also volunteered to shoot the game for the local greenwich village paper, The Villager. The specifics of the play are as follows. 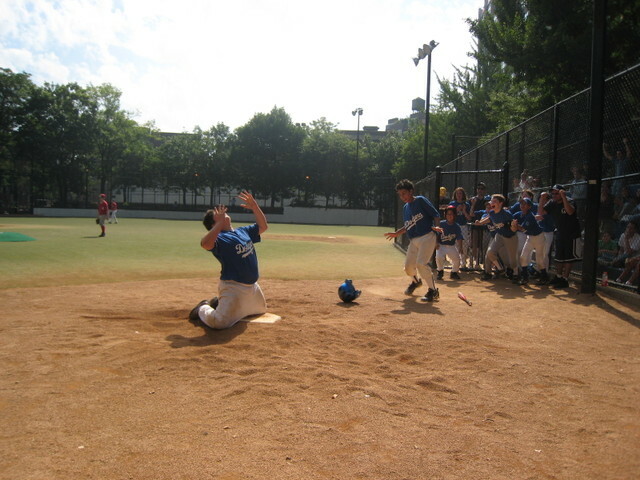 Dodgers vs Reds for the Greenwich Village Little League championship. Dodgers in control for the entire game until a 6th inning rally by the Reds puts them up 4-3 going into the bottom of the last inning. Avery, shown leading the pack of teammates out onto the field, walked, stole second, then third, and got home on a wild pitch setting up the dramatic ending. David Heffernan, aka Hef, who is the kid sliding/kneeling at home, stepped up and proceeded to slam a walkoff homer deep over the center left field fence and onto Leroy Street. What an ending and what a photo. Congrats to the Dodgers, including my son Josh.